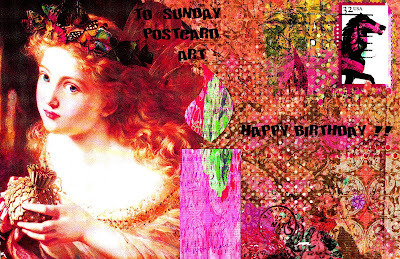 This is my Birthday Postcard to Sunday Postcard Art . I want to express how much fun I have had joining in the weekly themes and seeing so much beautiful art from so many incredible, inspiring artists around the world. I have only been blogging since February of this year and discovered this site in late March, but have met many wonderful new friends and look forward to their weekly contributions. The themes are varied and challenging and they really get me off of my artistic duff-so to speak. 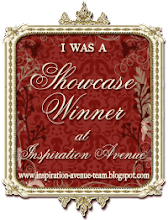 Thank you SPA for an inspired format to help me gain confidence with my blog and my craft. I hope you continue to grow and bloom. Happy Birthday! 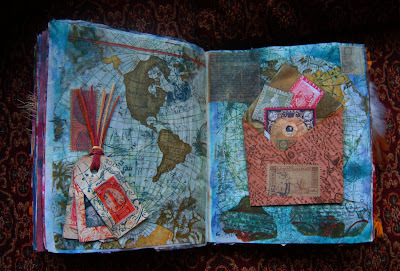 This is an altered book I made and these two pages are entitled "Journeys". The pages are hand painted and map images (tissue paper) are applied and then gone over with shimmer paint powders. I handmade the envelope and all tags with decorative paper and rubber stamped images. I love making altered books - this one is pretty thick- but getting a nice patina with age! This is my entry for "Altered Books" at Saturdays Workout. This is a collage made from a black and white photo from the late 1920's of my Grandmother Doris when she was dancing with a modern dance group the "Denishawn Dancers". 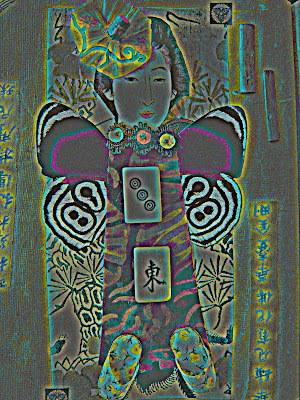 I scanned the photo into Photoshop and added a solarized and soft light effect to add color and highlights. 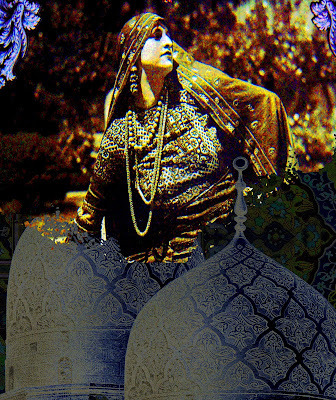 I also imported images of middle eastern towers to carry the theme of the dance and costume she is wearing. 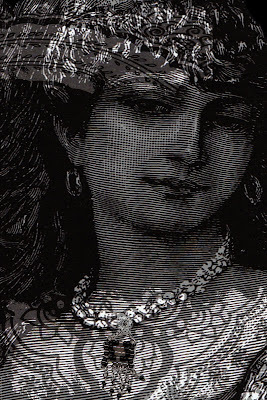 She was quite the bohemian and always inspired me with her exotic tastes and love of ethnic dance. This is for Inspire Me Thursday's theme "Altered Ancestors"
I love the colors purple and green - alone and combined together. There is a coolness and warmth in combination that I am very drawn to. 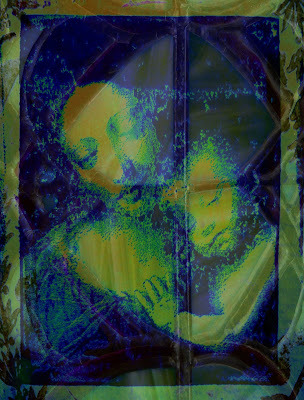 This is a collage that I made from a journal page of a stamped mother and child (Madonna) with an imported photo of a stained glass piece that I made to give it an "old world" effect or looking through a window kind of feel. This is for Wednesday Stamper theme "Purple and Green"
This is for Think Monday Think ATC "Wild Animals'" theme. Being a holiday today I had a little time to make an ATC. Its a new size for me and was fun! 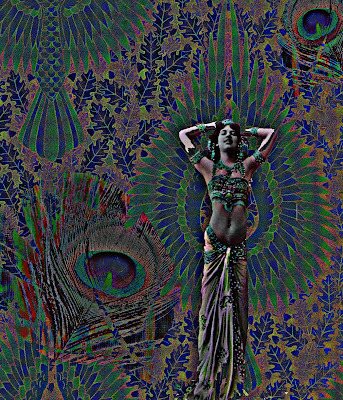 This digital collage is made from Art Nouveau bird patterned wallpaper(background), Lunagirl images and peacock feathers that I scanned and digitally colored. 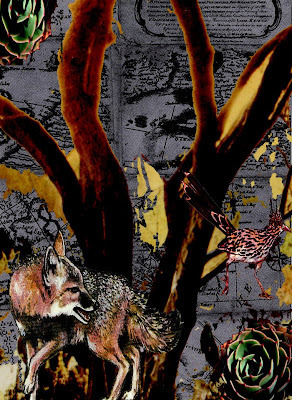 The theme "Feathered Friends" is for Mixed Media Monday. 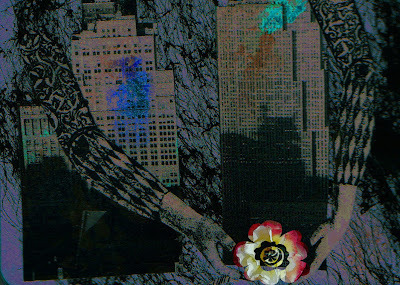 This was a fun digital collage I made for SundayPostcard Art's theme "Numbers". 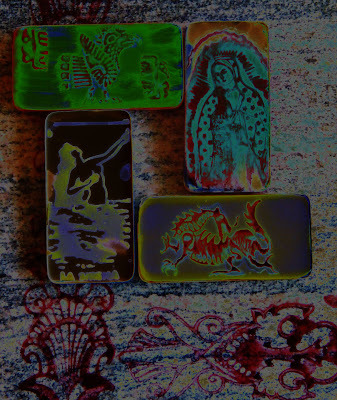 I used 2 antique playing card images (Dover) and color altered them digitally. The background is from a journal page I had made that worked well with the piece. I added decorative scanned paper for arch and crowns using the cookie cutter tool (PS). I added numbers to represent playing cards. Easier said than done! The theme for this weeks Inspire me Thursday is "warrior". For most of my life when I envisioned a warrior I ususally saw a man engaged in some sort of warfare or challenge, but in fact a warrior to me now is someone of strength whether that be physical , emotional or moral. A champion who knows herself or himself well enough to not engage in battle but has the inner strength to achieve their goal through modest means and calm determination. 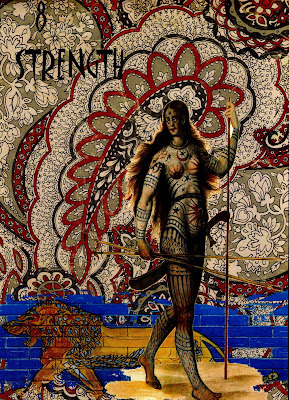 This is a digital collage that I made for my Tarot series- this being the number 8 card "Strength". 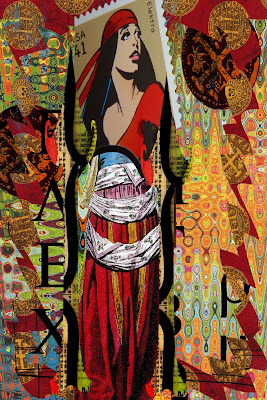 I found images that for me depicts a warrior that walks in strength and is empowered. I stayed a bit traditional with the use of a female image and a lion. 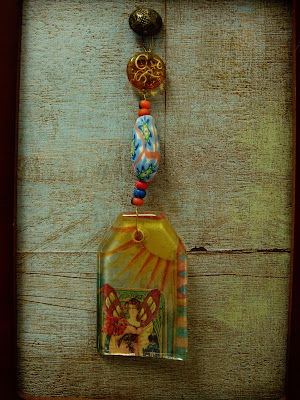 These are dominoes that I used rubber stamps and alcohol inks to create the desired effects. I bonded them to granite tiles and created a background with rubber stamp borders. 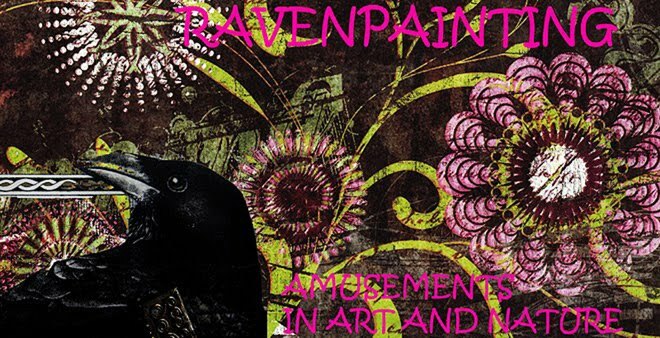 This is for the theme of "Mixed Media" for Wednesday Stamper. I attached heavy- duty wall hangers and display these as a group of granite tiles. This was a fun and expressive challenge for me! As these challenges come fast and furious (which in some ways is good for me) I am learning to really get my materials in order and my thought processes as well! 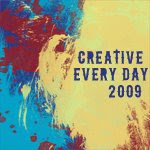 Not easily done- since I have been rather slow creatively over the past two years -until I started to blog. Themes like "Altered People" for Mixed Media Monday really make me go places I might not have tried. I'm still working it out... and having fun! This weeks challenge for Sunday Postcard Art is "Postage People". I have collected a number of stamps over the years but oddly not too many with "people" in them (more flowers, birds, animals etc.) This is part of the "superhero series " and I had fun putting together a digital collage. I added text, layering and mixed elements that I scanned in. 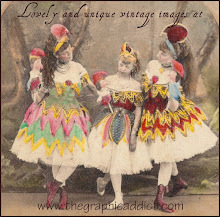 Labels: Postage stamp, vintage images digital papers. This is a photo I took of my husbands hands holding a rose from our yard. I erased out the background (the floor) and edited the photo with a Fresco mode and added a decorative background with Photoshop. "Petals" is the theme for this weeks Inspire Me Thursday. 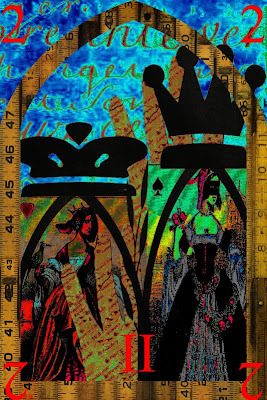 This is one of my digital Tarot cards "The Lovers". It was originally made from one of my journal pages. 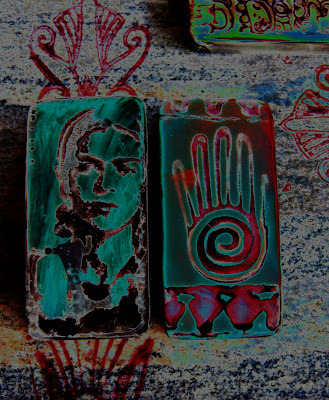 The central figure is a rubber stamp of a merman and mermaid embracing. 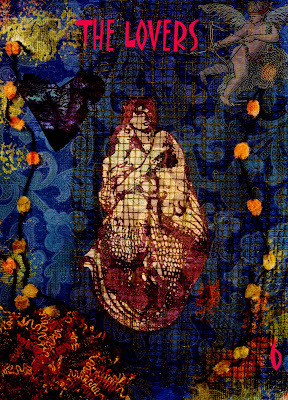 I added netting and mixed elements (fabric trims), scanned it to the computer and added a cherub and some text. I think this works well for the Wednesday Stamper theme this week of "Under the Sea". 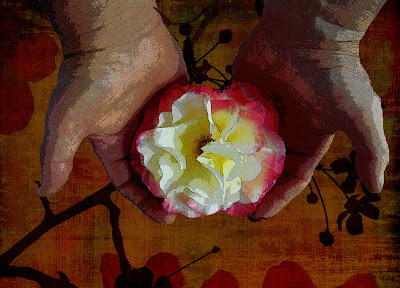 "Helping Hands" is the theme for Mixed Media Monday. This is a collage page from my Urbanology Journal. I imported a photo I took of a rose from my yard and added it in Photoshop. It represents the helping hands of the many people who build urban gardens in our cities to help beautify them. The theme for this weeks Sunday Postcard Art is Alice in Wonderland. In this I used a (hand-shaped tag that I made with (non-sequitor) rubber stamps and decorative collage papers and combined them for the effect. 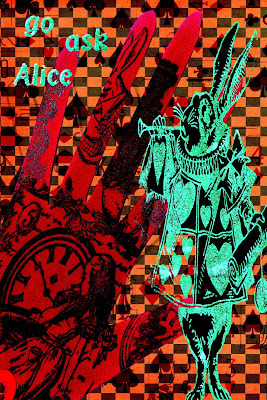 Alice dreams in vivid color! I have always thought that "Family" is more then just ancestry (especially since mine is so mixed up!) and like to think of the family of mankind representing us all. We are all related and we have all branched out from the same tree so to speak. 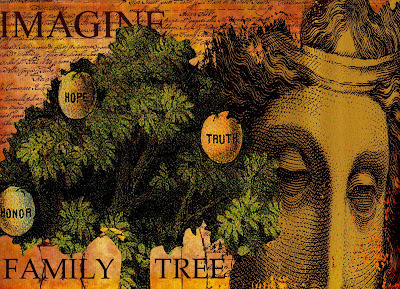 Imagine if we honored our "human ancestry" as if it were our "own" family history- I dare to think we would all feel related to each other a lot more. For IMT challenge. 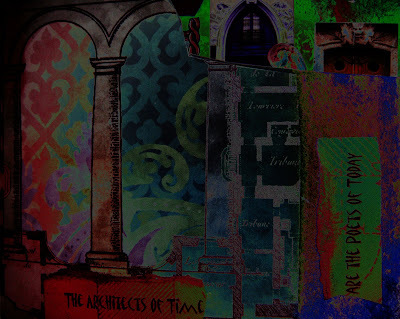 This is a page from my Urbanology Journal that reflects the inspiration that I have always found in (all things from the past). A lot of the things I make either end up looking old or I purposefully "antique" them. I guess there is a sense of ageless beauty that art aquires over time that (for me) gives it meaning and endurance-it has earned its place. Submission for Mixed Media Monday. 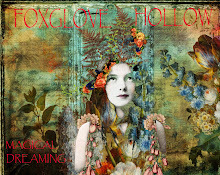 I so love color, but I found this challenge for Sunday Postcard Art inspiring in different ways. Just like black and white photography lends to more drama in photos, I found that collage takes on the same effect. I started with a black background then added an Indian Mehndi design- followed by a journal page I had made (extracting all of the color). I was happy with the results!